Date started: unknown but sometime after 2000. 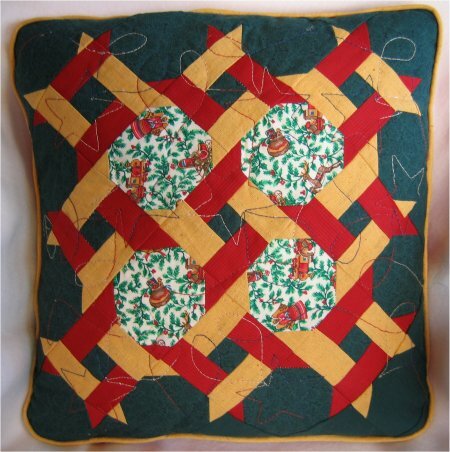 To tell you the truth, I'm not sure when I started this 15" pillow, but I do remember that it was to test out the Garden Twist pattern to see if I actually liked it enough to make a quilt out of it. And I know this was the reason because only (most of) the green and the print fabrics are "quilting" fabrics ... the others are oddball stuff I had laying around. I got the pieced pillow top mostly done, but I ran out of the green background fabric. At that point, the immediacy of finishing the pillow top became less pressing and I tucked it away as a UFO. I'm sure it's been "ageing" for at least 3 years. Since I have resumed working on my UFO list, this seemed to be the easiest one to finish, as it it was nearly done. This layout is constructed diagonally and the lower right corner and 1 setting triangle were made from an almost-matching solid. Even close-up, I bet you wouldn't be aware that two different fabrics were used in the background. It feels VERY nice to check off one more UFO.